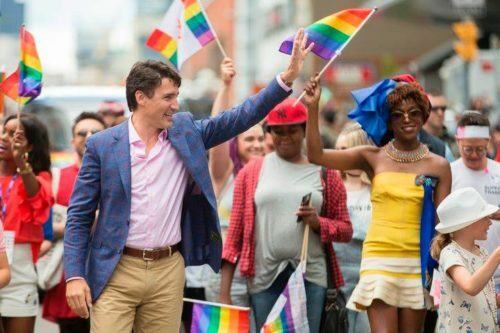 Canada’s photogenic prime minister has been a bright star in Toronto’s Pride Parade. Justin Trudeau marched as Labor Party leader in 2015, and, in 2016, he became the first Canadian prime minister to attend Pride Toronto and celebrate with the million people in attendance. He returned in 2017, this time in colorfully striped socks that celebrated the end of Ramadan, the Islamic holy month of fasting, which coincided with Pride. Trudeau’s support extends beyond the parade. On Nov. 28, 2017, he spoke before a packed House of Commons and delivered an emotional apology to LGBTQ Canadians for what he called state-sponsored, systematic oppression and rejection. “You are professionals, you are patriots, and, above all, you are innocent. And for all your suffering, you deserve justice, and you deserve peace,” Trudeau said.